HCM CITY (VNS)— Continuing to use heritage buildings is a good way to conserve them in Viet Nam, especially HCM City, the deputy mayor of a French city yesterday told a round table on heritage conservation and sustainable urban development in HCM City. Gilles Buna of Lyon said the city should carry out extensive research on how heritage buildings can be used in an appropriate manner. With his experience in urban heritage conservation, he urged the city to identify what should get priority when it comes to conservation and how to suitably conserve and enhance urban heritage values in a dynamic and rapidly growing city. 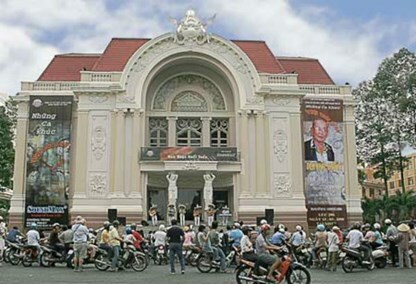 Ly Khanh Tam Thao, deputy head of general planning management at the city Department of Planning and Architecture, said heritage conservation in the city, especially of heritage buildings, had been challenged during the process of urban development. The city's responsibility was to contribute to the country's economy and attract more investment, he said, adding that many heritage buildings had been rebuilt completely because of economic imperatives. A survey by the HCM City Urban Development Management Support Centre, better known by its French acronym PADDI, found that more than half of 377 of the city's heritage buildings had been pulled down and rebuilt in the last 20 years. Dr Nguyen Thi Hau, deputy head of the city's Institute for Development Studies, expressed the fear that the remaining heritage buildings would be knocked down and replaced by commercial buildings. Ton Nu Thi Ninh of the Sustainable Development Working Group said conservation of its urban heritage was vital for creating the city's identity. The city once dubbed the "pearl of the Far East" was now just known as a dynamic economic city, she said. Preserving its urban heritage was, however, one of the ways to boost its economic development, she added. Hau said the city should have measures to enhance is urban heritage values. But awareness of heritage conservation in the community is low, she said, pointing out that common people have an important role to play in it. If the community does not participate, conservation is not possible even with good planning, she added. Dr Fanny Quertamp Nguyen, co-director of PADDI, added that conservation should focus not only on individual buildings but also the landscapes around heritage buildings. Dr To Kien of the Singapore University of Technology and Design said the island's experience in urban heritage conservation showed the success of co-operation between the private and public sectors for the task. Its strategies were a good reference point for Viet Nam, he said.